I have been studying and performing deck cleaning and staining for several years now. Before we built our own deck on our home, I wanted to know the best way to maintain it for a good appearance, long life, and ease of care. Anything takes some care, even the so-called “maintenance free” man-made decking. What I came up with is this–thoroughly clean and prepare the wood decking (treated wood, or cedar), and apply a good stain with a color about every 2-3 years. The coloring in a stain (as opposed to a clear water-resistant sealer) helps to prevent UV damage from the sun, which is a big part of what causes deterioration of the wood. Even some of the best wood deck treatments I found advised applying their treatment EVERY YEAR! Neither I nor my clients in my business would want to hear that! So I kept looking. For cleaning a deck, I have found that a strong solution of liquid automatic dishwasher cleaner (like Cascade), along with a portion of bleach, applied to a deck does a good job of cleaning. If it is not cleaning, mix it a little stronger. But do not use too much cleaner or bleach, as it can hurt the wood, too. Apply the cleaner, and then use a brush and rinse with clean water, or use a pressure washer (WITH CARE) to rinse away the soil and to clean up the wood. DO NOT LEAVE THE CLEANER ON THE WOOD VERY LONG, OR LET IT DRY ON THE WOOD–KEEP IT WET. If the deck is quite soiled it might take another application. If the wood needs to be lightened, an acid application (sold as “deck brightener”) can be applied and let sit for the appropriate time, then power washed or rinsed off. Then let the deck dry thoroughly for 2-3 good drying days before applying a stain. The very best stain finish I have found for wood decks is Olympic Maximum, which comes in a clear, or in several colors like a redwood, cedar, and brown, but the “Honey Gold” is my favorite along with most of my customers. It has a very rich, natural wood tone to it that is quite pleasing to look at. It lasts at least two years on the horizontal decking and handrails, and up to four years on vertical posts and balusters. I would advise re-doing after 2-3 years for the best looks and results. But if the deck is protected under a roof it could go much longer! 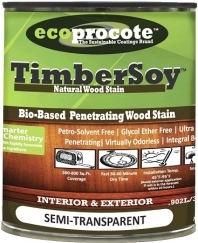 If there is a better stain/finish for a deck, I would love to hear about it, and would consider switching to using it. I have replaced the flooring and railings on my deck, adding the spindles between support posts. That is all new wood. However, the supports and main portion of the deck is original and in good shape. Unfortunately, the original owners stained it with a redwood stain I do not like. Do you have any ideas on whether mechanical sanding is worth while to remove this stain? Or would it be better, or even possible to use a darker stain such as a coffee to provide a redo of this stain? 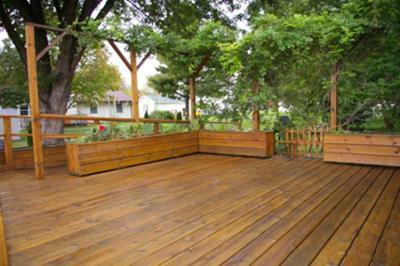 As part of your washing you could use a deck stain stripper to remove the stain. Or just see if a darker satin will cover.